Rotary knife lathe tooling / cutterheads are quite simply a dedicated repeat tool systems that are capable of the rapid mass production of a turned item, mounted on a "Rotary Knife Lathe" and are typically used to produce furniture or staircase components! The knives are bolted to knife holders which in turn are bolted to the hexagon sleeve. Typically a tool of this type will genuinelyproduce between 20000-35000 Softwood spindles before a regrind is required. To the right is an illustration of a typical "Hydro Lock" cutter head. Again; this tool produces the very same 41mm Colonial style spindle (above). This tooling has numerous distinct advantages over the hexagon sleeve tooling, more details can be found further down the page. 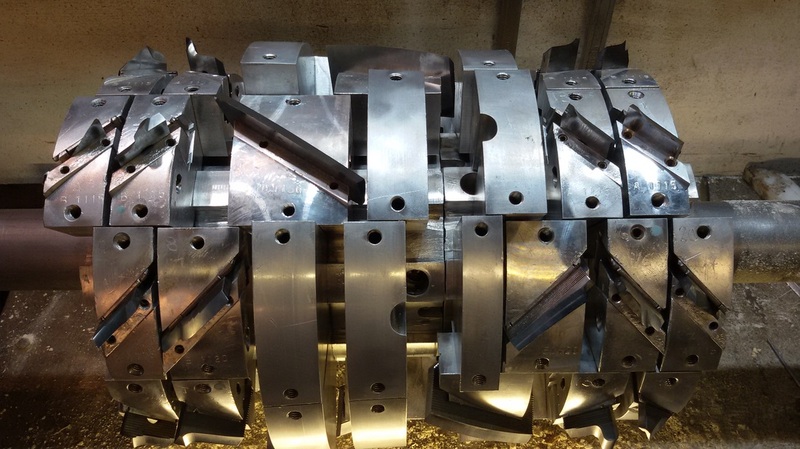 This type of cutter head is designed for high volume manufacture where units in excess of 800000 are produced annually over an 8hr working shift! Typically a tool of this type will genuinely produce between 35000-40000 Softwood spindles before a regrind is required. ​All systems are built around a template grinding system. 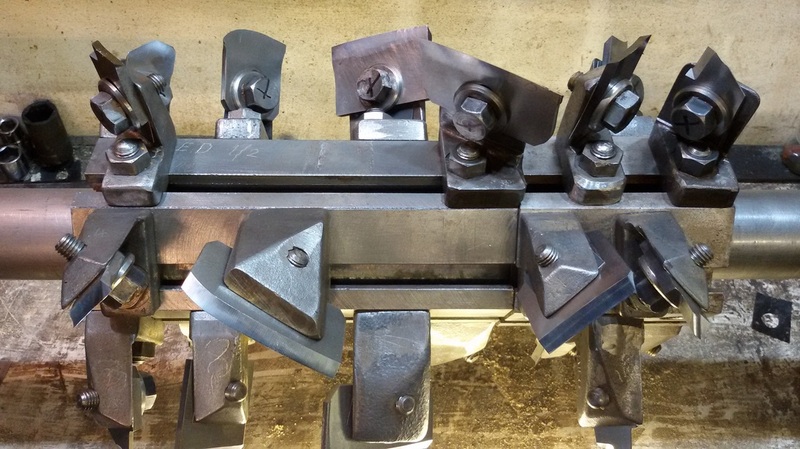 The setting of the knives of the cutter heads are to a hard wearing "Tuffnol" profile. 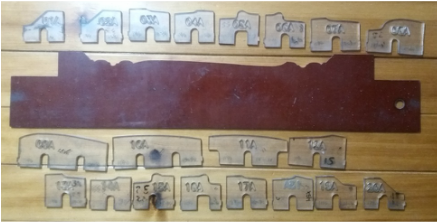 The individual grinding templates are exact profile copies of the knives. This system ensure a high degree of repeat accuracy to ensure that after a service / regrind the continuation of your products profile does not alter or deviate over time. Profile Design Tooling acquired the assets of SRB Tooling in November 2012, following the untimely death of Roger Bowness. I'ts my intention to continue the great service and support offered by Roger to the wider woodturning community. In the late 1990's and early 2000's many woodturning companies invested in the "Rotatec computerised tooling system". If you are a user of this system, as an assurance to you, we have cataloged and hold all the relevant patterns, profile grinding templates, and blue print fact sheets, relating to your tooling.